The British pound today fell from yesterday’s 2-month highs against the US dollar following Theresa May‘s victory in the no-confidence vote against her on Wednesday. The GBP/USD currency pair today declined as markets monitored Brexit developments amid low volatility. The GBP/USD currency pair today dropped from a high of 1.2993 in the Asian session to a low of 1.2926 in the European session. The cable’s decline today could largely be attributed to Brexit concerns as the UK government insists that it cannot rule out a hard Brexit. However, markets were slightly pacified by Theresa May’s call to the Labour Party leader Jeremy Corbyn to share his Brexit ideas with her government so that the country can move forward. The release of the weak UK retail sales data for December also contributed to the cable’s decline. According to the UK’s Office for National Statistics, headline retail sales declined by 0.9% in December versus the expected 0.8% contraction, while the core retail sales dropped by 1.3% versus the expected 0.6% decline. The pound also rallied against the euro this week and is set to close the week with its biggest weekly gain against the single currency since September 2017. Despite all the turmoil witnessed in the UK political scene, it turns out that this might be a week of record gains for the British pound. The currency pair’s short-term performance is likely to be affected by Brexit headlines and UK political developments. 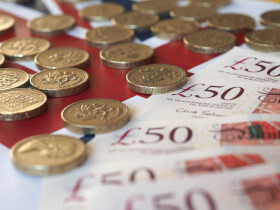 The GBP/USD currency pair was trading at 1.2940 as at 11:52 GMT having dropped from a high of 1.2993. The EUR/GBP currency pair was trading at 0.8815 having rallied from a low of 0.8770.